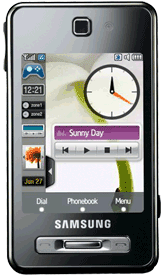 When I reviewed Samsung’s touch screen feature phone, the Tocco SGH-F480, I described the home screen widgets, part of the company’s “TouchWhiz” user interface, as “a fun but under developed feature”. At the time, the Tocco only offered seven widgets, including a clock, calendar, birthday reminder, photo browser and music player, and I bemoaned the fact that third-party developers were unable to create more. Indeed, widgets built using common web standards are fast becoming the lowest common denominator for application development across all three screens, something that Samsung is keen to highlight in a bid to attract developers to its TouchWhiz platform. Samsung says that developers will have the choice of whether to charge for their TouchWhiz widgets or offer them for free, although all offerings will need to be certified by the company first.